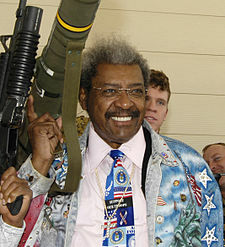 Officials with the American Gaming Association say boxing promoter Don King and celebrity chef Emeril Lagasse will be inducted into the Gaming Hall of Fame later this year. promoted 25 bouts for Muhammad Ali and has also promoted George Foreman, Oscar De La Hoya and Joe Frazier. Association officials said in a release that King — who has presented more than 500 world championship fights — helped make Las Vegas and Atlantic City two of the most visited places in the world. Lagasse owns four restaurants located in casinos, three in Las Vegas and one in Gulfport, Miss. The four were to be honored by the industry group at a dinner in Las Vegas in September.